On Sunday, November 13, 2016, Council 3956 will once again hit the grills and ovens to make a delicious FAMILY BREAKFAST. This month’s recipients are St. Vincent dePaul and the Downriver Food Pantry. Both of these charities need help to feed our Downriver families during this holiday season. 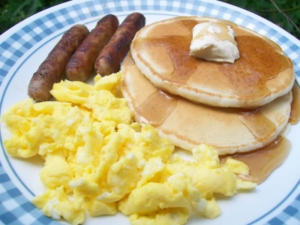 Come by after Mass to the St. Pius Social Hall and join us for eggs, pancakes, sausage, fruit, juice, coffee and/or tea. It’s a free-will donation, so bring the whole family. Even if you can’t afford to pay anything, stop on by… we have you covered! We will also have tickets for sale for our 4th Annual CHRISTmas Concert featuring the Michigan Catholic Choir for only $10 each!